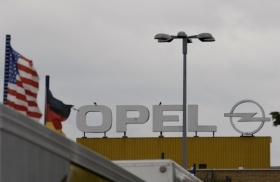 Germany's finance minister said Opel could get German aid. MUNICH -- GM has paid back another tranche of a 1.5 billion ($2.2 billion) euro bridge loan advanced by Germany in June to save Opel / Vauxhall from bankruptcy. GM said Friday it had paid back another 200 million euros of the loan. "We now have an outstanding balance of 400 million euros, which we expect to pay back by November 30," Enrico Digirolamo, GM Europe chief financial officer, said in a statement. The German government provided 1.5 billion euros to keep Opel afloat when GM went into its 39-day bankruptcy. A further 4.5 billion euros was offered to help Opel restructure, but the offer is now in doubt after GM decided to keep Opel instead of selling the German-based automaker to Berlin's preferred bidder, Magna International Inc. Earlier today, GM reaffirmed it wants state aid to help overhaul Opel after a newspaper quoted GM's chairman Ed Whitacre as saying the U.S. carmaker will not ask German taxpayers for help. Attending an event at the Texas Lutheran University earlier this week, Whitacre told a German journalist that the U.S. carmaker was financially strong enough to stem the costs itself. Whitacre also distanced himself from comments by GM CEO Fritz Henderson, who apologized to Germany for the way the Opel sale issue was handled. "I don't agree whatsoever with Henderson in that regard. The decision-making process may have been confusing for some, but we have nothing to be apologetic for," Whitacre said. Separately, German Chancellor Angela Merkel told the Frankfurter Allgemeine Zeitung newspaper she expected GM to remember the role Germany played in saving Opel from insolvency in June when Detroit decides which Opel jobs to cut in Europe. Half of Opel's 50,000 employees work in Germany. GM's management indicated it could rely on U.S. taxpayer money if needed, but believes that European governments are willing to assume the risk since GM's restructuring plan is just as comprehensive as Magna's was. The topic is politically sensitive in Germany since GM reversed its decision to sell a 55 percent majority stake in Opel to Canadian supplier Magna and its Russian partner, state lender Sberbank. "The restructuring of Opel for long-term sustainability requires involvement and financial support from all stakeholders, including employees and governments," GM Europe said on Friday. "We remain in discussions with governments to engage our plan in the same way they were willing to do with the Magna proposals to provide the best possible footing for Opel / Vauxhall success." Britain, Spain, Belgium and Poland also host Opel plants. Magna's plans foresaw cutting 4,000 Opel jobs in Germany. Unions in Germany fear far more could be at risk now because GM Europe production boss Eric Stevens had originally seen a need to shut German Opel plants in Bochum and Eisenach. German Economy Minister Rainer Bruederle said on Thursday that GM did not need state aid for Opel because the company can shoulder the cost of restructuring by itself, citing comments attributed to Whitacre. Bruederle's cabinet colleague, Finance Minister Wolfgang Schaeuble, told WirtschaftsWoche in comments published on Friday that GM may indeed receive some aid from the German government. Said Schaeuble: "We just cannot say we would have done everything for Magna, but for another owner it's entirely out of the question since we feel a responsibility for the people" working there.